The Kindle Paperwhite has an impressive form factor. It makes reading such a pleasure that the device seems to disappear. I love reading, and I have loved every one of the kindles I have ever used. So I could not wait to get my hands on a Kindle Paperwhite. 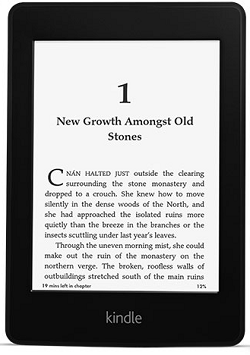 Amazon promotes it as the worlds most advanced e-reader, and it does not disappoint. The build in light works really well, so at last I can read in bright light or no light at all, without any problems. I can finally lie in bed and read without a bed lamp. The light has bunch of settings that allows you to adjust it for whatever light conditions you find yourself in. The tech behind this build in light is awesome. It actually shines the light onto the text from above. This means that it is not as tiring on your eyes as a computer monitor or iPad. One of my favourite features of the Kindle Paperwhite is the ‘time left’. Instead of viewing the progress in the book on the bottom right corner you can change the view to the estimate time you have left to finish the book. The battery life on the Kindle Paperwhite is also impressive! Even with the light on, will it last a reported 8 weeks. I have only had it for about two so I will see if it can make it that far. This is also my first Kindle with a touch interface. I have been a little nervous to try it up to now, but with all the other great features I decided to give it a try. The touch actually works brilliantly. I don’t know why I was hesitant. I also got the Kindle Paperwhite specific cover, which fits it like a clove. It complements the already impressive form factor of the kindle. It makes reading such a pleasure that the device seems to disappear and you can just get lost in the book. The only problem is that currently they only sell this in the US. So I had to drive across the border to get one, but it was well worth the 80km road trip to Eureka, Montana. If you can get your hands on one of these, make sure you take it! This entry was posted in Reviews, Tech Toys on 2013/01/07 by Justinus.